This is just a quick note to say that I will be taking a break from blogging, not that I have been the most prolific blogger over the last year anyway. I will be doing my best to avoid obsessively checking my book sales, kindle unlimited pages read, reviews and all forms of social media. This will be cold turkey for me and I expect tears and tantrums! I haven’t written properly for months, so starting now I have to commit to finishing The Sentinel’s Alliance and getting a publication date set for this year. I also have to prepare for the Winchester Festival and perfect my first chapter and synopsis, plus I have been speaking with a narrator regarding the possibility of producing an audiobook for Visions of Zarua! I feel like I have so much going on that I need to step back and just focus on the writing. I will be back in April with some books reviews, and hopefully more news on the book front. Please message me if you want to get in touch and I will respond as soon as I can. The picture below is where I need to be in my head, writing until my fingers bleed! I haven’t done one of these posts in a while. But right now, book reviewers and book bloggers I need your help! I have 3 fantasy books published and I would love to get them reviewed on Amazon, Goodreads and your blogs. Over the last few months I’ve been overwhelmed with the amount of pages read in Kindle Unlimited – hitting between 22K and 24K per month! Those numbers are a dream come true for me, but unfortunately none of these pages read have converted into reviews. I would love to get some reviews for my books and I’m offering reviewers ARC copies of their choice. We can even run book giveaways for your readers if that’s something that would interest you. I’m going to the Winchester Writer’s festival in June and I would love to be able to put in my cover letter that I have 60+ reviews and 100+ ratings on Goodreads. Can it be done? With your help, anything is possible! The magical island of Kalaya is dying, along with its Sentinel. The Assembly controls Kalaya. Originally set up to govern, they now persecute those with magic and exile them to the Turrak Mountains. Tei, a tailor’s daughter, has always hidden her magic but when her father’s old friend visits and warns them to flee to the mountains she must leave her old life behind. On the journey, an attack leaves her father mortally wounded. He entrusts her into the care of the exiles and on his deathbed makes a shocking confession. Struggling with self doubt, Tei joins the exiles search for the new Sentinel who is the only person capable of restoring the fading magic. But mysterious Masked Riders are hunting the Sentinel too, and time, as well as hope, is running out. Against mounting odds it will take friendship, heartache and sacrifice for the exiles to succeed in their quest, but is Tei willing to risk everything to save the island magic? The Sentinel’s reign is doomed to failure unless Tei can prevent the Kalayan people from plunging into war. With magic restored on Kalaya, life is flourishing for Tei and the exiles. But Rathnor’s plans for war soon escalate and thwart any chance of peace. Two wizards, 350 years apart. Can they save the realm of Paltria from Zarua’s dark past? Apprentice wizard Paddren is plagued by visions of a city on the brink of annihilation. When his master dies in mysterious circumstances, the Royal Order of Wizards refuses to investigate. The investigation leads Paddren down a sinister path of assassins, secret sects and creatures conjured by blood magic. But he is guided by a connection with a wizard from centuries ago – a wizard whose history holds the key to the horror at the heart of the abandoned city of Zarua. Can Paddren decipher his visions and save the Paltrian people before the dark menace of Zarua’s past is unleashed? Please get in touch with your book choice. Here’s my contact form, or reply in the comments. Please share this and help me spread the word, I appreciate your support. Just a quick reminder that the special birthday price for the ebook of Visions of Zarua – a standalone epic fantasy, is increasing tomorrow. I reduced the price in November during the book birthday blitz hosted by Rachel’s Random Resources. You can see my highlight posts here part 1 and part 2. I’ve had some wonderful reviews and am really pleased to see the avg Goodreads rating of 4.26 based on 46 ratings. You can see the reviews here, but for now here are a few quick quotes. I’d love to sell a few more copies. If you fancy picking up Visions for just 99p, you need to act fast. Why not check out this preview to help you make up your mind. FANTASY MEETS MYSTERY IN THIS STANDALONE EPIC FANTASY. I have toyed with the idea of an audiobook for a few years now, but I was always put off by the length of my book and the cost that would mean for the customer. But now I see many of my fellow indie authors going for it I’ve finally decided to try it out for myself. I’ve registered Visions of Zarua with ACX and it’s ready for narrators to audition. Now comes the difficult part – getting in touch with narrators. I’ve spent a few fun hours listening to voice samples and I have found a couple I really like. I plan to approach them soon, but it is impossible to know what kind of voice will work for a novel with three male viewpoints and one female. I suppose I will know the voice when I hear it, the same as I knew this cover was the one the moment I saw it. If you are interested in auditioning here’s the ACX link to see Visions of Zarua’s audition request page. I’d love to hear from you and see how you plan to bring the book to life. Advice wanted – If you have produced an audiobook, or are an author whose book has been narrated, maybe you could share some of your knowledge and tips? I will do a follow up post in the future on my experience with audiobooks. For now I shall leave you with the blurb and Amazon / Goodreads links of you want to find out more about Visions of Zarua. 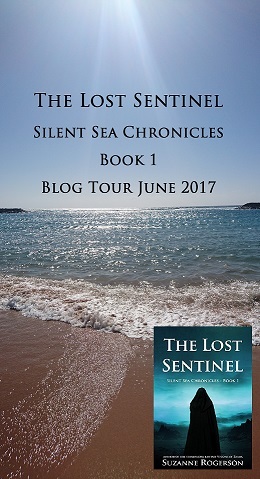 My big news is of course that The Sentinel’s Reign – Silent Sea Chronicles Book 2 is now published. It’s available here in ebook (99p for a few more days only), paperback and free to read on kindle unlimited. That’s the sales bit out the way. In other news, The Lost Sentinel (Book 1) is entered into SPFBO 2018 competition and has been given to Lynn’s Books to judge, which is funny as I had planned to contact her to review the book this year. There is also a cover competition going on right now. Of course I love my cover, but there are lots of great covers in the running from my group of 30 so it will be interesting to see which ones get put through to the next stage. 2018 has seen some major steps forward for me – landing a publishing contract with a Czech publisher for Visions of Zarua and having a full manuscript request from a UK agent for the same book. These are milestones I’ve been dreaming of, but we’ll have to see where they lead. I’m learning that everything takes time in the publishing world and you need to have a lot of patience! My 2018 goals in review. At the beginning of the year I set myself some goals (post here). Today I am revisiting them to see how I’ve done. Publish book 2 The Sentinel’s Reign = Achieved. Finish first draft of book 3 The Sentinel’s Alliance = Nope, but I have planned 2/3’s in a rough draft. Look at WIP to see if I want to send to agents = Still to do. I have a draft almost finished that I would love to edit and polish and send to agents. I am also thinking on an idea I would like to try out on Wattpad. I have no idea how to go about this so I need to research it more. Attend more writing events = I’ve attended 1 this year. Contact book reviewers = I have done very well with this so far and have a new batch of reviewers to contact very soon. If you are a blogger interested in reviewing my books please use this contact form. Learn more about marketing and get my books in front of more readers = I entered SPFBO (self published fantasy blog off) along with 299 other entrants, which will hopefully give The Lost Sentinel some much needed exposure. If you have read The Lost Sentinel, please consider leaving a review on Amazon / Goodreads, it helps with the ranking of the book though won’t have any affect on how far the book gets in the competition, that’s down to the judge of each group. I’ve run a mildly successful kindle countdown deal for The Lost Sentinel and it will go on Netgalley for a month starting 9th July. Tidy up blog, create banner and landing page = The blog is better but could still do with a tidy up, and I have a cool new banner. The landing page is something I still need to look into. Blog more and focus on books about writing = I have reviewed a few writing books. Feature more guest posts and get involved in more blog tours = I have featured Susan Leigh Noble and Ari Mehlen, but there is always room for more. Healthier diet and walk more = I lost almost 2 stone with Slimming World in 4 months, so that was a great success at the start of the year and I have been maintaining my target weight. I bought a treadmill and used that through winter but now it’s gathering dust. Get more sleep = No chance! The hot weather and the book release don’t add up to a good night’s sleep. Maybe one day I’ll catch up on my beauty sleep. Be more positive = I’m trying to be positive and take things as they come. For me being proactive helps, but when nothing comes of all the hard work I’ve invested it’s difficult to keep upbeat. Read more fantasy = Yes. Post more book reviews = Nope, I am way behind and have given up keeping my book review page up to date. Read at least 35 books in 2018 = I’m trying but I’m behind schedule, total to date is 16. My reading has been very slow. Editing and promotion has taken all my spare time and I’ve even struggled to find any audio books that hold my attention. My tbr pile grows almost daily and I am not making a dent in it. I am still reading my book group choice Senlin Ascends (a previous SPFBO contestant, now traditionally published) even though I missed the group meeting last week due to a mix up with the day on my calendar! I believe it was enjoyed by all. I did have a list of books I wanted to read and a couple of trilogies I wanted to finish, but for now I’m just going to wait and see what books take my fancy. I hope to feature on a few blogs over the coming weeks and see some more reviews go up for The Lost Sentinel and The Sentinel’s Reign. Then I plan to throw myself into writing and make lots of progress. Fingers crossed anyway. Because of this I will probably take the summer holidays off from blogging to focus on writing book 3 – The Sentinel’s Alliance. It worked well last year, though hopefully I can keep my hand in with a book review or two. How’s your year shaping up? Last plug for The Sentinel’s Reign – don’t forget to pick it up for 99p as I will be putting the price up at the end of the week. And add it to your Goodreads shelf. This morning I’m really pleased to share a 4 star review of Visions of Zarua. Rebecca is a YA Mystery author and she says she’s really liked how I merged the genres of fantasy and mystery.